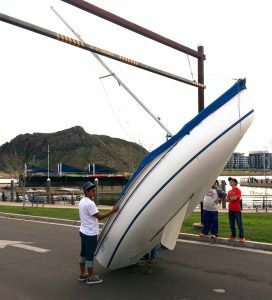 Lurking over the driveway entering and leaving the Tempe Town Lake launch area is the sailor’s nastiest enemy: a rust-colored, camouflaged mast-killing bar pointed at the spreaders of careless crossers. Sunday it killed another one. George Tingom has tried to keep score of the number of crumpled masts and boats tossed off their trailers by the mast killing bars, but he long ago lost track. He and I have tried to work out a better solution with the City of Tempe, but nothing we’ve thought of seems to satisfy the risk control people or avoids heavy cost of redesign and reconstruction. So, for more than a decade, the bars have stalked us, killing and maiming the unwary. The bars hit just above the spreaders of a C14 sailboat on a trailer and they’ve been put there to prevent sailboaters from driving near the high power lines that parallel highway 202. Too close, they say, and the power lines could arc to the mast and perhaps hurt someone. Or induced static electricity could zap a nearby boat with a mast. 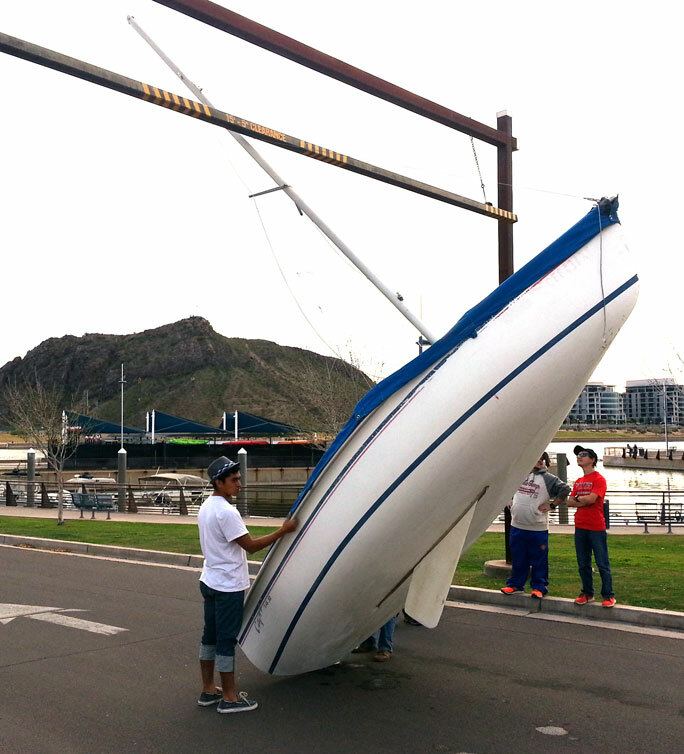 Sunday’s incident knocked one of the ASF boats off its trailer, but the mast survived the attack. 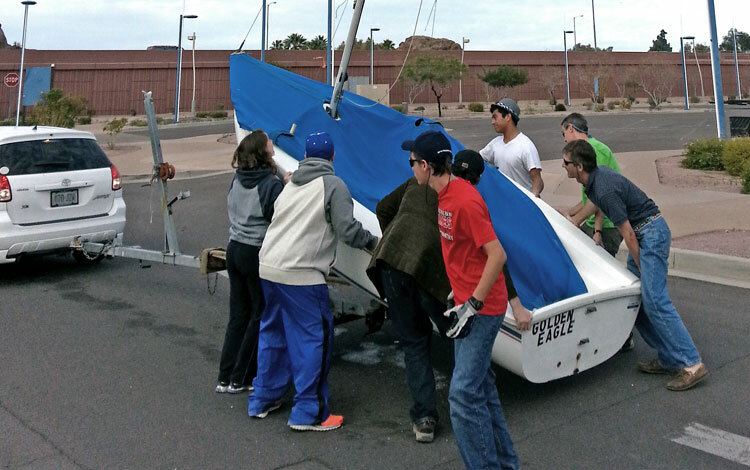 The boat was one being fixed up and sailed by a high school student. Moments earlier, I too got a stern reminder that you should look overhead before towing a sailboat. Turning a corner inside the fenced area, my boat’s mast struck one of the visiting University of Minnesota rowing shells that were sticking way out and overhanging the drive. I’ll be calling Catalina in a minute to order a new mast, my third for the boat. What happened to the first one? The mast-killing bar got it.